The display is arguably the most important piece of hardware a laptop. After all, it’s the means by which you actually use the device. Yet displays are also difficult to explain and understand. They can be measured, but most people are not familiar with what those measurements mean or how they relate to their own viewing experience. Contrast. Screen Resolution. Black level. Gamut. Uniformity. These words can seem like arcane scrawl to the initiated, but they’re actually not difficult to grasp. Here’s our guide to the terms you need to understand when considering a notebook display, along with what to look for in each one. You’ve probably heard it before, but screen resolution refers to the number of pixels packed into the vertical and horizontal areas of any given display. Some of the most frequently used screen resolutions include 1,920 x 1080, and even 1,024 x 768. These numbers can get confusing thanks to the different display aspect ratios available. Sometimes these resolutions are listed at FHD, 1440p, 1080p, 4K, or QHD. Each of these terms still refers to the total amount of pixels packed into the screen resolution. For instance, 1080p packs a standard 1,920 x 1080 resolution, whereas QHD and 4K pack in 2,560 x 1,440 or 3,840 × 2,160, respectfully. Our guide to buying displays and monitor resolutions is available, but in most cases, the higher the resolution, the sharper the picture. That is often what you can get in new displays, and what newer terms like 4K or QHD refer to. Displays — and laptops — with 1080p or FHD resolution displays happen to be the most common and cheapest in the market. In most recent times, 4K options have also become available, but are often quite expensive. The Dell XPS 13 happens to be one of the best laptops we would recommend its superb screen resolution, ranging from 1080p to 4K. This phrase is one that you’ve almost certainly heard before. Display manufacturers love to use contrast ratios because of all the impressive zeros they get to slide in. Numbers are easy to understand, and the higher they are, the better their display seems on paper. Contrast ratio is simply the ratio of luminance between the brightest color (white) and darkest (black) on a display. Higher ratios are considered better because it means images will appear more defined and realistic.There’s just one small problem. No one uses a standardized test for contrast ratios. There are many ways to fudge the results, which is why there are inexpensive displays that claim insane ratios like 10,000:1. You should trust contrast ratios as they’re reported in reviews. In-depth analysis using identical testing methods and equipment is the only way to discover a display’s true contrast. The laptop with highest contrast ratio we’ve ever tested is the 4K version of the Dell XPS 13, though laptops in the Surface and MacBook line often include high contrast as well. Brightness is important for mobile devices like laptops, smartphones and tablets. Most devices have a glossy display to enhance contrast, but the gloss makes reflections an issue in bright rooms or outdoors. These reflections can only be defeated by a bright display. The Nit is the standard unit of luminance used to describe various sources of light. A higher rating means a brighter display. Displays for laptops and mobile devices are usually between 200 and 300 nits on average. A rating over 300 nits is solid and a rating above 500 nits is extremely good. Only a few devices can put out that much light. Apple’s MacBooks are known for having the brightest screens on a laptop. It’s 13-inch MacBook Pro we reviewed had a screen that maxed out at 548 nits. Televisions are a different story, and the brightest go north of 1,000 nits. Reviews of displays, including ours, will often make reference to black levels. You might be able to infer that this has something to do with how the display renders black, but it doesn’t explain much else. Black level itself is expressed in a number, with lower being better. A black level of 0 represents a dark, pure black. The number is relevant because it has influence on how a display handles dark images. If you ever watch a movie on a bad display you will notice that details are missing from dark scenes. That’s because the display isn’t capable of reproducing the darkest portions of the image. White levels are the opposite. The higher the value, the better. A white level of 255 is the maximum on the RGB scale, so an ideal display will come close to that figure and display a bright, unblemished white. Modern displays have a better handle on white levels than they do black levels, so it usually is not a defining quality. But an exceptionally good or bad result can make a difference. Microsoft and HP collaborated in 1996 to create a standard color space known as sRGB. As you might imagine, it’s most relevant to computers. A color space is a standard gamut of colors that displays should be capable of reproducing. 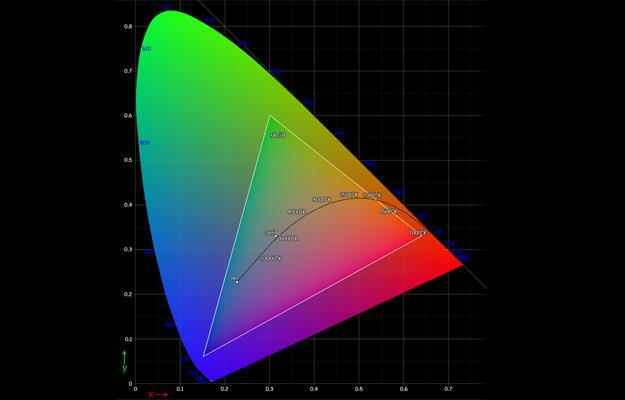 These days, most laptops you purchase can handle most of the sRGB color space. Even most midrange IPS display can handle around 90 percent or better. That’s why by today’s standards, we often test color gamut using the AdobeRGB color space. Though it is less important than sRGB, only the highest-quality laptop panels handle over three quarters of this color space. Only professional, high-end laptops like the MacBook Pro, ThinkPad X1 Extreme, and Dell XPS 15 reach the high 90s of both sRGB and AdobeRGB. Almost all displays on the market today use LCD technology. This technology has been refined so that it’s inexpensive and of high quality, but does have a few drawbacks. Among these is the fact the panel itself emits no light. For a picture to be visible a light must be shown through the LCD. In an ideal world the light behind the LCD would be equally bright in all areas, but that’s easier said than done. Most displays are at least a bit brighter in some areas than in others. This is a uniformity issue. We have tested displays with uniformity issues that were severe enough to be immediately noticeable by an untrained eye. The problem is most obvious during dark scenes and is most prevalent in mobile devices. Plasma and OLED don’t have this problem because they create their own luminance. We commonly use a banding test image when looking at a display. This image displays a gradient of shades between absolute black and absolute white. A perfect product will display the image as butter smooth, but most don’t. Bands often appear in the image and are most common in its darkest quarter. Banding is a noticeable problem. It’s common in any content that depicts a grade of color that gradually shifts. A photograph of a sunset is a great example. Banding will cause the photograph to have unnatural layers of color that shift abruptly. HDR is a relatively new term in the laptop and display market. Better known as high dynamic range, it is slowly becoming a term to find when shopping for new displays or laptops. It is not at all complicated and is just a technology which allows for a high level of contrast between light and dark images on a screen, and for a better color depth in images. Some Windows 10 laptops now come with HDR displays, but it doesn’t make for much difference for the interface and visuals across the operating system. Instead, HDR is what can make movies and games bright, vibrant, and fun to watch or play. Keep in mind that only a few programs currently support HDR, and you might need to manually enable it in Windows Settings to get started. A laptop like the 3rd generation ThinkPad X1 Yoga is one of the best for enjoying HDR content. Measured in hertz, a refresh rate is a term which explains how often a display can change the picture in a second. Common refresh rates include 60Hz, 120Hz, and 144Hz, but these have nothing to do with color accuracy or resolution. Still, for gaming, refresh rates are especially important. Playing games at a native refresh rate on a monitor or laptop is best since it can avoid screen tearing, where the video card is pushing out frames that a display cannot support. More and more video cards like the Nvidia GTX 1080 or RTX 2080 can power frame rates over 60Hz, so it is an investment in a monitor or laptop with a high refresh rate ensures the best possible experience. As most gamers can attest, the difference between playing a fast-paced shooter on a 144Hz screen versus a 60Hz screen is, quite literally, game-changing. While high-refresh rate displays are only now beginning to appear in gaming laptops, we would recommend the Alienware 17 R5, which supports refresh rates up to 120Hz — or even the Razer Blade 15, which goes up to 144Hz. “Screen door effect” is a phrase used to describe a monitor that has a visible gap between individual pixels. The technical term for this phenomenon is “dot pitch,” which describes the size of individual pixels and the distance between them. A low dot pitch means gaps should not be easily visible, while a high dot pitch means the opposite. The impact of dot pitch is relative to the device. The gap between pixels becomes easier to notice as the distance between the display and its user decreases. That is why dot pitch is most often a problem on a mobile device. Monitors and HDTVs usually don’t struggle with this problem because the user is much further away. Hopefully, this explanation has helped you understand how displays are measured. We do not refer to these terms in every review because we want to make our reviews as approachable as possible, but sometimes it’s impossible to avoid the technical talk. Now you will know what we’re on about.